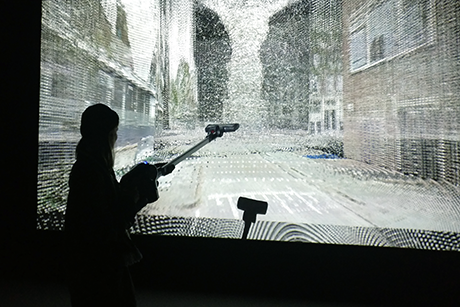 Terracleanse is an immersive experience in which participants journey with a vacuum cleaner through an endlessly, unfolding, point-cloud reconstruction of exterior spaces projected on a large screen. The project combines depth map information and panoramic photographs from Google Street View's API in an ethereal labyrinth which expands in real-time. 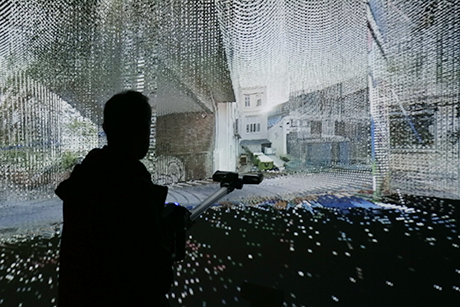 Standing in front of a large projection screen, armed with a wireless vacuum cleaner, the user begins with choosing his or her most unfavorable street, neighborhood, city or conflict area. They can then explore and decide which parts of the projected reconstructions should be vacuumed. Users can have private, economic or political motivations for selecting what must vanish. Whether it is the parental home, a city zone requiring (urgent) gentrification, a contested political geography or buildings that are simply too unsightly to remain in existence, Terracleanse bestows the user with humorous power to choose which locations in their world should be vacuumed. ‘Out with the old and in with the new’, after all, it is about cleansing.